In this heart-pounding, starkly colored, and visually stunning graphic novel, three women have twelve hours to get out of Cuba with six-million dollars on the night of New Year’s Eve 1958. Gangster’s moll Carole, jazz singer Taffy, and mambo queen Ana all have their reasons for needing to escape the El Eden Casino in Havana. And on the tumultuous night of New Year’s Eve, when Cuban dictator Fulgencio Batista flees the country and the nation falls to Fidel Castro, they get their chance...with the help of six suitcases filled with stolen dirty money. Of course, it’s one thing to get the cash...and quite another to get off the island alive. 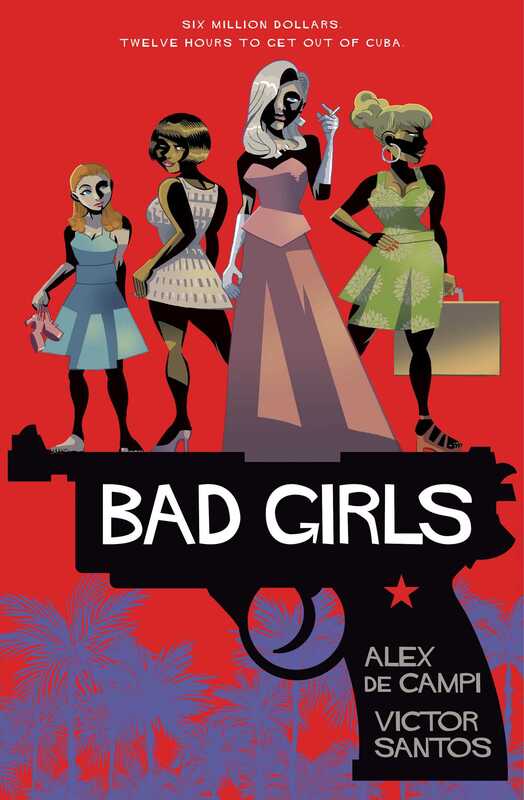 From the Eisner-nominated writer Alex de Campi and virtuoso artist Victor Santos, this story of three strong and multifaceted women struggling to leave their pasts behind in a tension-filled getaway is timely, fast-paced, and gripping. Alex de Campi is best known for her critically acclaimed teen survival thriller No Mercy and the groundbreaking, digital-native comic Valentine. She was nominated for an Eisner for her first comic work Smoke. Alex also directs music videos, and has worked with acts as diverse as Grand Duchy (Frank Black / Violet Clark), Joan As Police Woman, and Amanda Palmer to the retro-fabulous Puppini Sisters. Victor Santos has written and illustrated a variety of comics in Spain and France, including Los Reyes Elfos, Pulp Heroes, Young Ronins, Lone in Heaven, and Black Kaiser. In recent years he has begun his American adventures with Demon Cleaner and Zombee, written by Miles Gunter, and Filthy Rich. His last works are the new current series of The Mice Templar, the James Patterson’s Witch & Wizard series, and the Godzilla: Kingdom of Monsters series. He has won several awards. He lives in Bilbao, Spain. "De Campi and Santos bring out the best in each other’s work. De Campi characteristically excels at psychologically complex characterizations, and never once overburdens readers with padded backstories, or pedantic history lessons. And Santos brings an infectious dynamism to every action scene with clean line work and bold panel layouts that bring to mind formative draftsmen like Jim Steranko, Darwyn Cooke, and Bruce Timm."